web site requires the Adobe Flash Player. 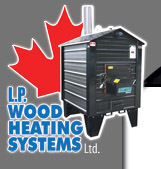 Welcome to the L.P. Wood Heating Systems website. Overview of the Empyre Outdoor Wood Furnace models. Safety, quality workmanship, quality efficiency, qualities, conveniences. How Empyre Outdoor Wood Furnaces work. Contact us to order from our list of parts and accessories. Local area maps showing our location. Contact us via phone, fax, email or mail.